Vets Adapative Sports: "This Is Not Your Father's VA Anymore"
Mark Lalli, a former Blackhawk crew chief, describes the thrill of his first time water skiing. Ann O'Brine is founder of U Can Ski 2 - a volunteer organization that makes water skiing available to disabled. Patrick Crockett, a former Army staff sergeant, wants more veterans to try adaptive sports. Iraq and Afghanistan war veterans are encountering a different mindset at area VA hospitals. The younger, post-9/11 veterans are used to X-Games and high-velocity sports. So, therapists and doctors are adapting. One wet and wild example was sponsored recently by the James A. Haley VA Hospital. A Veterans Adaptive Water Skiing Expo showed veterans the ropes recently at Seminole Lake Park in Pinellas County. Volunteers attach a metal frame seat to the single ski. A disabled skier is strapped into the seat. Mark Lalli was a Blackhawk crew chief before a helicopter crash landed him in a wheelchair. The Army veteran decided to try water skiing hoping to reclaim a sense of excitement and rush of adrenaline. Lalli was strapped into a metal frame attached that was attached to a single-wide ski and pulled behind a speed boat with two assistants at his elbows. That is the whole idea behind adaptive water skiing according to Ann O’Brine founder and director of U Can Ski 2. It’s a USA Water Ski affiliate ski club whose mission is to teach water skiing to disabled. “We’re not here to teach them just to water ski we’re here to teach them how to live again. Life doesn’t end when you buy your first wheel chair,” O’Brine said. She’s been in a wheelchair for 63 years since she contracted polio as a child. But, as an adult, she discovered adaptive water skiing. Ann O'Brine, founder of U Can Ski 2, kept volunteers organized and the speed boats running on time at the Lake Seminole Expo. Pain was the biggest fear that Army Staff Sergeant Patrick Crockett had to overcome his first time water skiing. He has had several neck surgeries and lives with a lot of discomfort. Crockett also lives with PTSD. He saw the water skiing expo as an opportunity to show other veterans how adaptive sports helped him. Putting veterans back into sports they played prior to their injury or getting them to try new sports is the job of Jamie Kaplan. Kaplan is a recreational therapist in the Haley VA poly trauma, spinal cord injury program. And Kaplan said there is no limit based on physical ability because it’s his job as a therapist to adapt equipment and the sport so every veteran can participate. 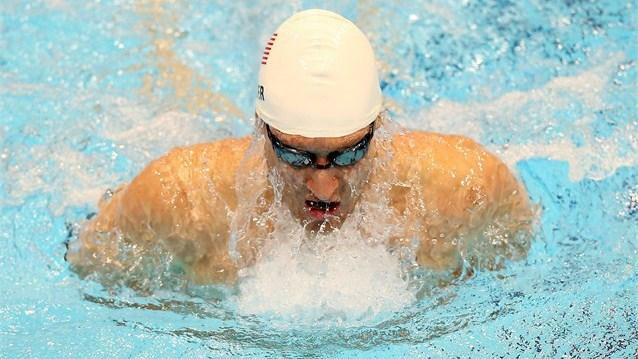 A year to the day an improvised explosive device took his eyesight, Navy Lt. Brad Snyder won his second gold medal in his favorite event, the 400 freestyle, at the 2012 London Paralympic Games. Snyder swam away from his competition, finishing with a time of 4:32:41, beating the next swimmer by almost a full 6 seconds. Snyder previously had earned another gold in the 100 freestyle and a silver medal in the 50 freestyle during the Games that run through Sept. 9, 2012.